also had its stake in creating our geological friend Iceland! This photo is emblematic of our experience on Santa Maria. A bike, some coffee, plenty of water: what more could you ask for? In fact so much of our time was spent just enjoying the lifestyle, which is very conducive for a leisure-seeking honeymoon. Though this website is devoted to bathing-spas, it is worth saying that other than using the sauna and hot tub at the Sao Miguel – Antilla Hotel Apartamento – we really did not find any kind of formal spas (at that point I also wasn’t particularly looking for that kind of thing). 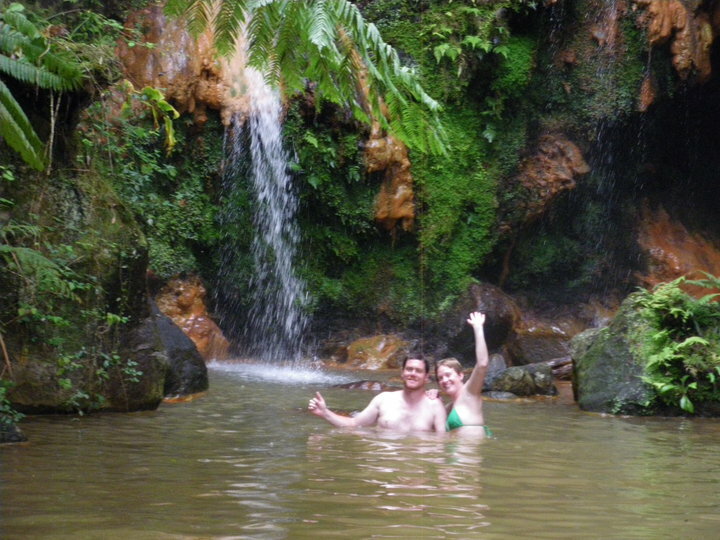 That’s not to say that you can’t find saunas, steam rooms and hot tubs in hotel in Sao Miguel but our main attraction to the beautiful islands of Os Açores were the amazing possibilities to explore natural hotsprings. That’s what sold us on this destination. But in the spirit of having a bathing experience, let me talk about some unique features that the Azores offer. 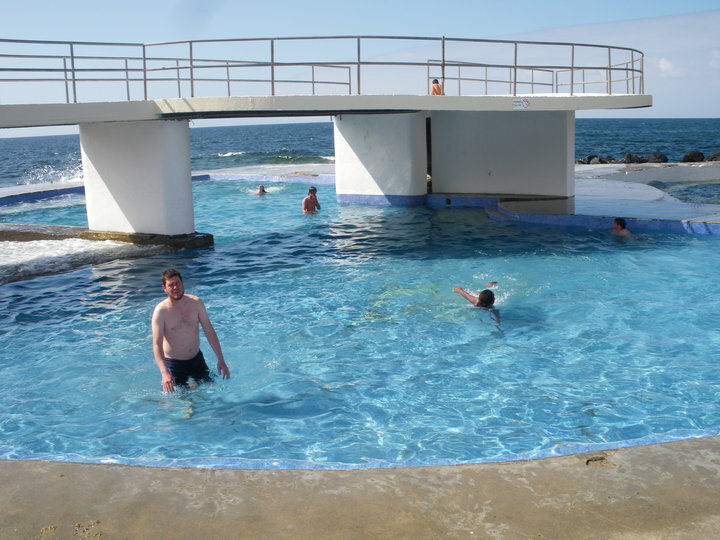 One of the very first things that amazed us was free outdoor public pools, that used salt water from the ocean. By virtue of capturing the ocean water and controlling drainage, these outdoor pools would warm up quite nicely and provide a refreshing alternative to outright frigid ocean swimming. 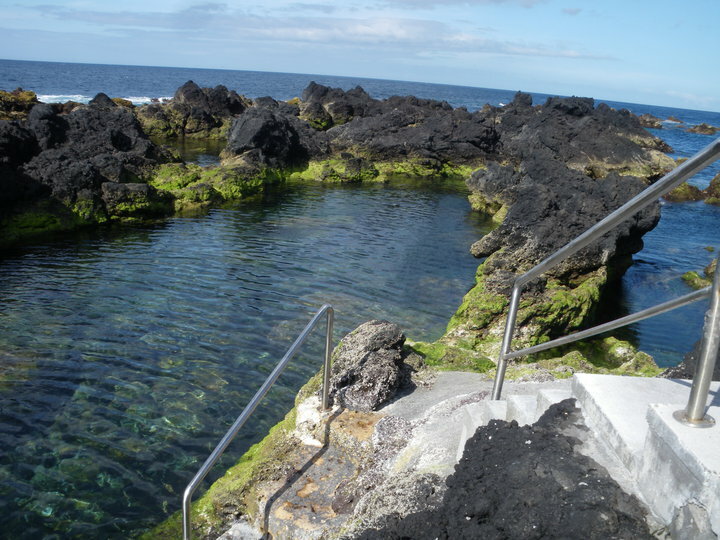 These public pools are spotted around the three islands that we visited (Santa Maria, Terceira, and Sao Miguel). But make sure you don’t get your hopes up. Many of them have fallen into disrepair, may become infested with jellyfish, or have, who knows what, living in them. We lucked out with this amazing pool at Anjos on Santa Maria. If the sun is providing the sauna, then this pool was a nice cold dunk after a good day of cycling. Another very emblematic photo of Santa Maria is this one depicting the steep and beautiful geographical plunges into the ocean. Amazing scenery, accompanied with beautiful hikes is one of the major draws to the Azores. We flew into Sao Miguel (1), took the ferry to Santa Maria (2), which makes it only fitting that our next island would be Terceira (3). It was after all (technically) the third island that we visited. (No, we didn’t plan it like that. There are 203 million native Portuguese speakers in the world. But Portuguese is close enough to Spanish [500 million speakers worldwide] to be able to know that ‘Terceira’ means ‘third’). 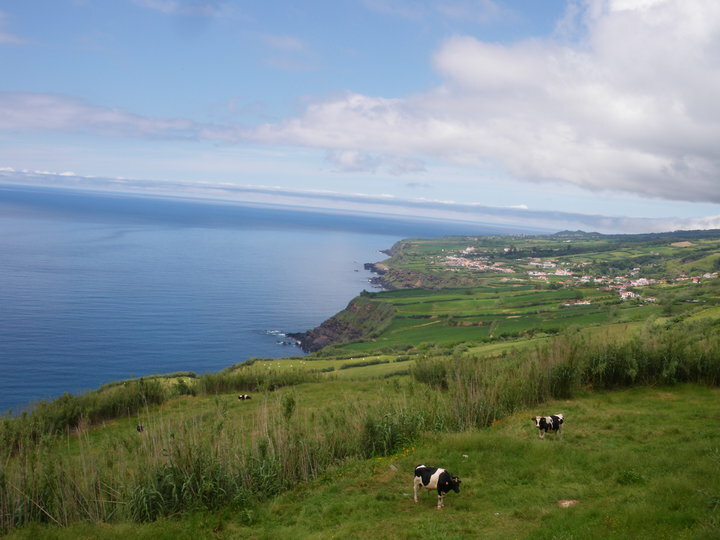 Terceira has something for everyone: lovely towns, mountains, valleys, bullfights, beaches, camping… etc. For me, Terceira was a time to learn more about geology. You see, my interest in hot springs, does not just end with the healing effects that the hot water has on our bodies and my mood, but the thought of these waters bubbling up from deep within the earth just to dissipate into steam upon contact with the surface, just amazes me. 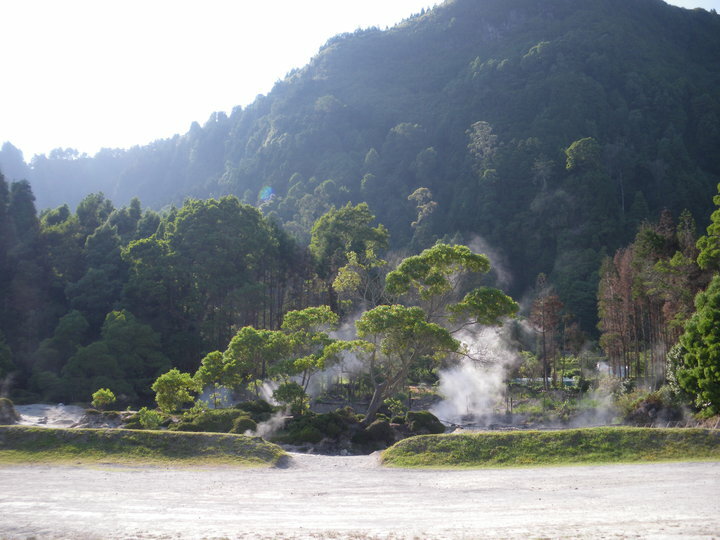 The volcanic phenomenon of Furnas do Enxofre is one of these places where sulphur-smelling, mineral rich water has steamed up to the surface for years and therefore created its own micro-climate and micro-ecosystem for the surrounding area. We couldn’t get close enough for a proper steam bath, but the visit still gave us that post-spa warm and fuzzy, relaxed feeling! For the geology lovers don’t forget Gruta do Algar do Carvao and Gruta do Natal. 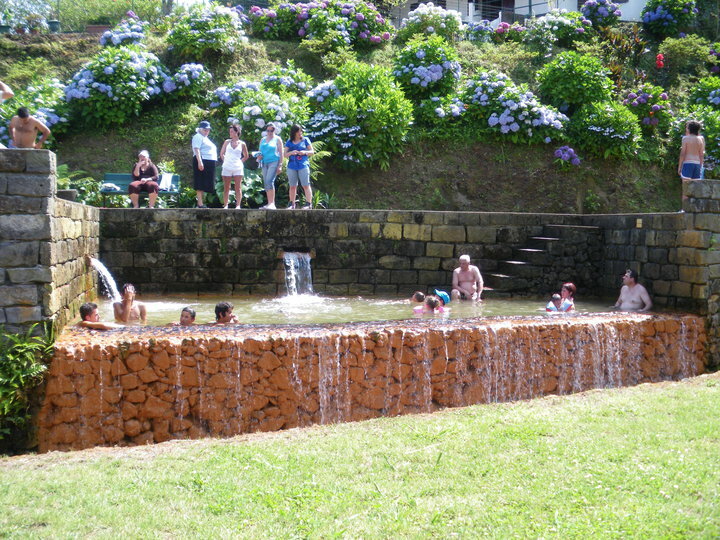 The must-have bathing experience on Terceira was the natural pools at Biscoitos. We took a rest day from biking there partially because we loved the cute little lizard-inhabited campground and partially because there was the best natural pools that we had come across. We got lucky: the sun was out and it was hot. 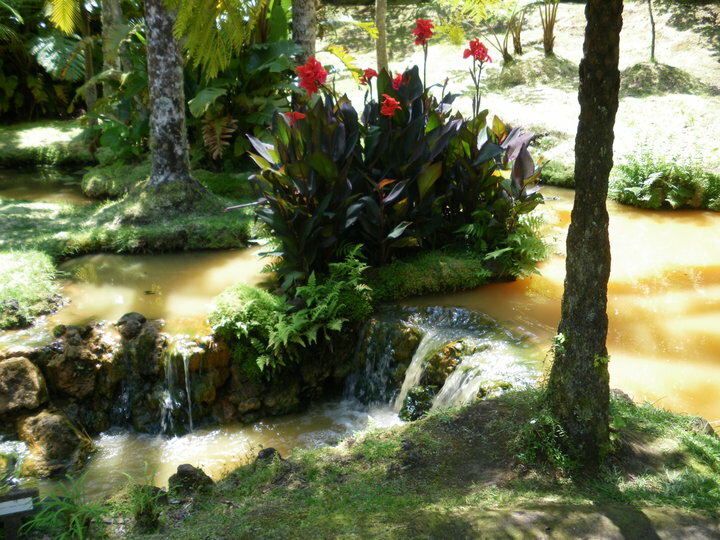 Biscoitos has a series of natural pools that have been made more accessible with concrete structures like stairs and entrance pads. The water was nice and cool and you can find spots that have had more access to the sun and are warmer. For the courageous there is also a diving spot. But do be careful, there is also a lot of sea life especially when the tide comes in. You have to watch out for jelly fish (pink), manawars (blue) and sea urchins. But there were about 4 lifeguards on watch (assumedly only during the peak season) and many of the locals will bring it upon themselves to get the jellyfish out of the water. During low tide you should be good. Beautiful place! We also went to vine museum/vineyard, which was nice. From Terceira we took the ferry back to Sao Miguel. Here there are a few of places of interest for hotspring seekers on this island. 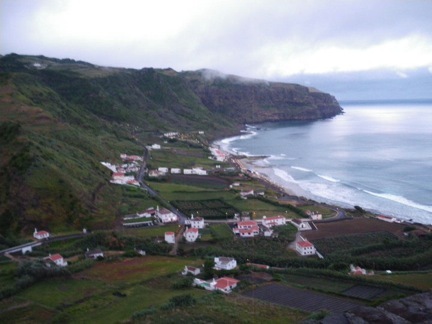 Furnas, Velha Caldeira, and Ponta da Ferraría. We made our way counterclockwise around the island from Ponta Delgada, and although there was quite a bit of an uphill climb after Vila Franco do Campo, we made it to Furnas in one day. Once you finally make it to the top of the hill, make sure you take your time to look around the Lagoa das Furnas before you go all the way down to the town of Furnas. 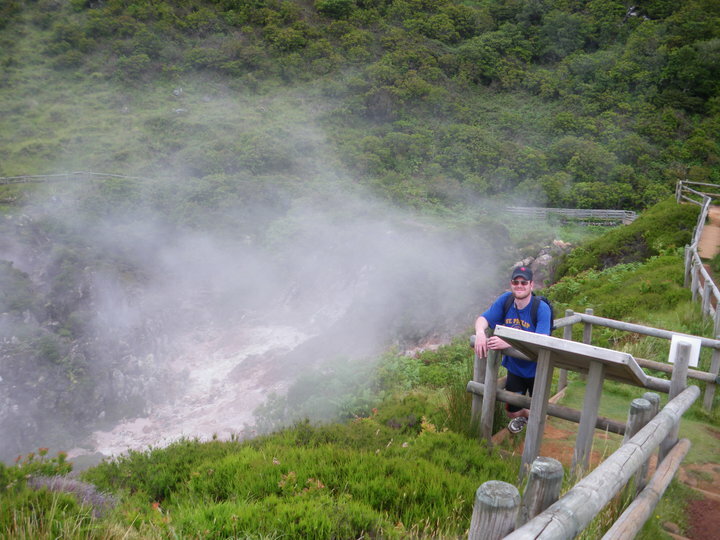 At the Lagoa das Furnas you will see your first glimpse of the fumaroles which are naturally occurring points where gas and steam are emitted. It’s quite cool to see. People have been known to cook things in the soil there. So once again we are offered insight into the geology behind our beloved hot springs. 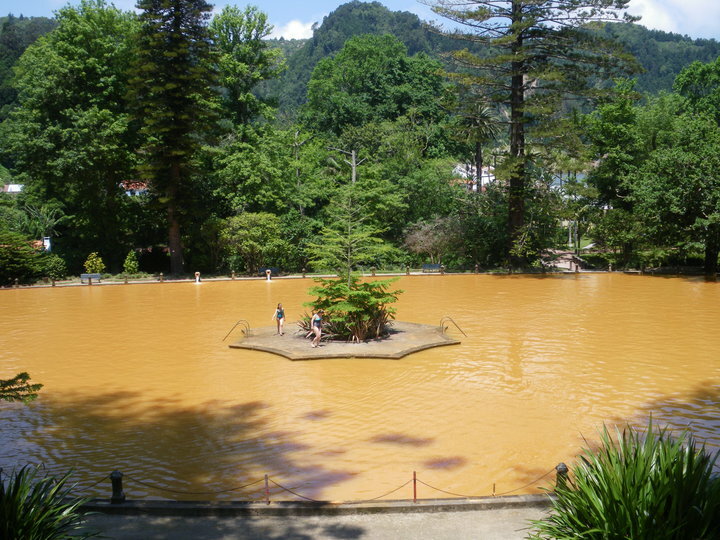 We only had one full day in Furnas, but I would easily recommend three days, especially because the campground is lovely and there are a few bathing possibilities that should be thoroughly explored. For example another amazing place to take in the natural mineral waters is the public pools. These pools are still in town but on the way back up to the Lagoa. I was first impressed with the design which entailed pools erected on the side of the streams that channeled both hot and cool springs. There are at least three pools at differing warmth and depths to explore and though the pools tend to be quite busy there is a feeling of enjoyment and carefreeness in the air. With ice cream and coffee always near-by, Furnas deserves 2 or three full days to explore, so now to rush my favorite destination of the trip. All amenities should be opened by the middle of June. Enormous hot spring pool in Terra Nostra. Jump in the water is lovely. Don’t forget your sunglasses. Just a little side note about tourism in the Azores, as Canadians we found it difficult to get a lot of specific information about destinations before our trip. In English, internet information is limited and the only guide book we could find was a Brandt – less than useful. However, you may have more luck searching in Portuguese and German for example. Note the ubiquitous hydrangeas amidst the lovely creek-side hot springs. These hot springs are open to the public. Having not budgeted enough time for Furnas, that’s all that we explored, but the tourist information attendant told me that there were some nice indoor pools. Unfortunately, we have no idea what these are like but I’m quite certain that they are in town. Make sure to stop in at the tourist information for all the details. If you go to those indoor pools let me know what they are like! Velha Caldeira. A hot spring waterfall was a nice relief to our overcast Ribera Grande rest stop. The only thing better than water bubbling from the depths of the earth is warm waters coming from the sky! Ribera Grande was in some ways kind of a weird place but we decided to stay there for a rest day so that we could check out the Velha Caldeira (see above). We had rain while we were there and it was deadly overcast. The town is nice but I have the feeling that on sunny days the real attraction is the beach. This beach also had an outdoor swimming pool. The only glimpse that we had of both of these was at night on the café/bar patio over a mojito – so really I can only assume it’s nice! We hitch-hiked from Ribera Grande to get to Velha Caldeira. Hitching was fairly easy anywhere on the island. We would have walked the whole way but we were a bit afraid of those crazy farm dogs – a few of which now we had seen off leash. Taxi’s or hitching was perfectly fine! Though the trail in the forest, you finally get to the source of the ever-so-familiar sound of falling water. It was overcast and though it wasn’t as warm as I thought it would be (perhaps only 30-33 degrees), it was still very comfortable. The closer to the waterfall, the warmer the water. It all seemed very logical to me! Watch out for jagged rocks at the bottom. 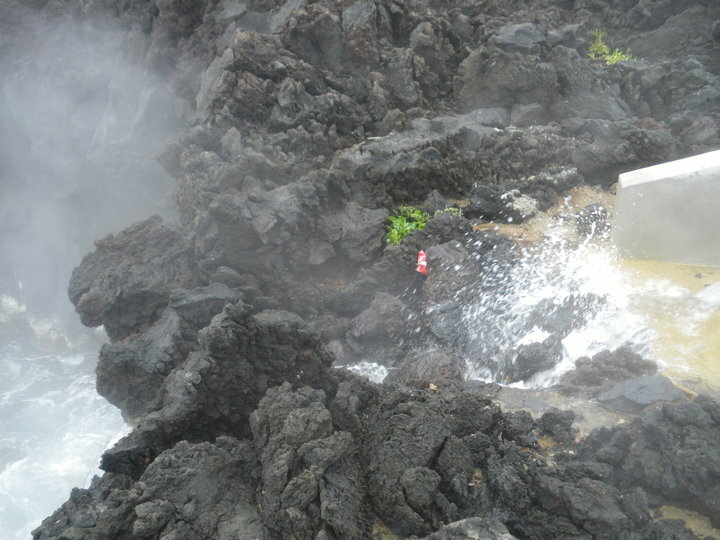 Oceans and hotsprings collide at Ponta da Ferraría. I guess I was a bit of a purest the day that we visited Ponta Ferraria. I was fascinated by the idea of hot springs warming up the ocean water, but I did not enter the ocean that day. Once again it was overcast and talking with locals, they told me that there is a specific time and tide cycle that makes sense to visit this spot. I don’t think that we arrived there at the right time. Also getting to Ponta de Ferraria, represented one of the issues that we had as cyclists – large hills to climb and limited taxis to help you get there. Hitchhiking and sweet-talking drivers on their lunch breaks seemed to get us through. (Note: English is not widely spoken in the Azores, Portuguese and perhaps Spanish are useful). Needless to say we arranged something with a driver that really didn’t provide us a ton of time there. Most tourists to the Azores rent a car, which opens up some possibilities but really cuts down the ability to take in all the scenery. Back to Ponta Ferraria, we checked it out and I think had the weather been better we might have stayed a bit longer. But what was particularly interesting here was the construction that was happening at the time. Having done some research, this is what they were building: http://www.termasferraria.com! This sounds like just the kind of place that Sao Miguel was missing. Sea water and thermal water jacuzzi, sauna, turkish bath, thermic contrast corridor, indoor swimming pool with sea and thermal water, and outdoor swimming pool with sea and thermal water…. What bathing spa enthusiast wouldn’t love this? If anyone has been there recently, I’d love a review. Given this new location, I would say that it would be the perfect end to the any Azorean adventure. 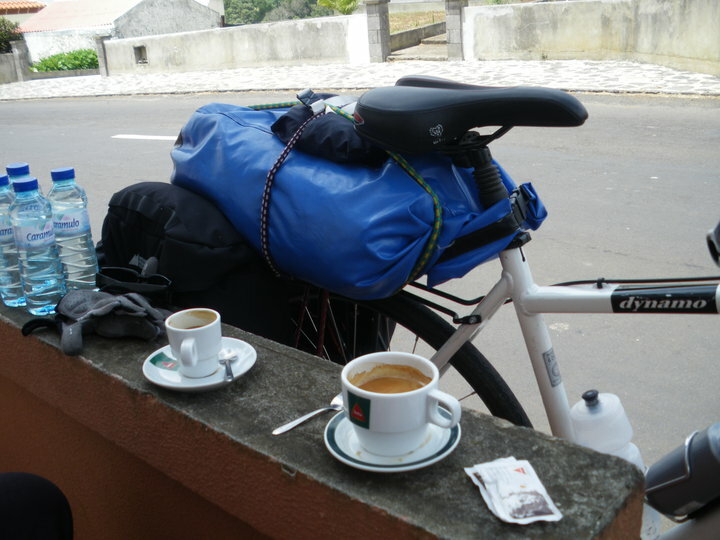 Our final day of riding – Sete Cidades to Ponta Delgada Airport – 37-40km. As I recall there was one bigger uphill after Feteiras but downhill after that all the way into Ponta Delgada. We met our first bike-tourers that day, from Germany. We tried to give them as much information as we could, but it was still their first day and they were still sorting out gear issues. We actually decided to go directly to the airport and pack up our stuff rather than go into town and come back. The bike boxes that we had left there at the ‘left baggage’ were still there! Amazing. We fixed up the boxes, took apart our bikes and kept just what we need for our last night in Ponta Delgada. 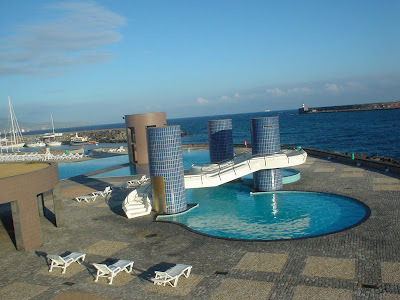 We took a cab into town and after checking into the hostel we went straight to the public pools down by the marina. We hadn’t in all our time been to that pool, but our last day of riding was a hot day and we were tired from packing everything up – so the water was perfect that day – it’s a huge pool! We spent the last night and part of the next day in Ponta Delgada relaxing on the wharf, watching mean looking fish chase away the small ones. We were very content with our amazing trip. The earth had created this amazing place, where people have found a perfect and comfortable balance between hot and cold, hot springs and ocean, sun and surf. An amazing place to visit – a great place for bathing enthusiasts.